In advance of the upcoming holiday, the Bermuda Hospitals Board has reminded everyone of the opening hours of the Lamb Foggo Urgent Care Centre in St David’s and the approximate wait times at the KEMH Emergency Department. The BHB said, “Bermuda Hospitals Board [BHB] wishes the public a happy and safe holiday weekend. However, if medical care is required, the Lamb Foggo Urgent Care Centre [UCC] in St David’s will be open from 4pm to midnight on Thursday and Friday, and from noon to midnight on Saturday and Sunday. “BHB also reminds the public that KEMH Emergency Department physicians see and treat patients based on the seriousness of their conditions, not in order of arrival. 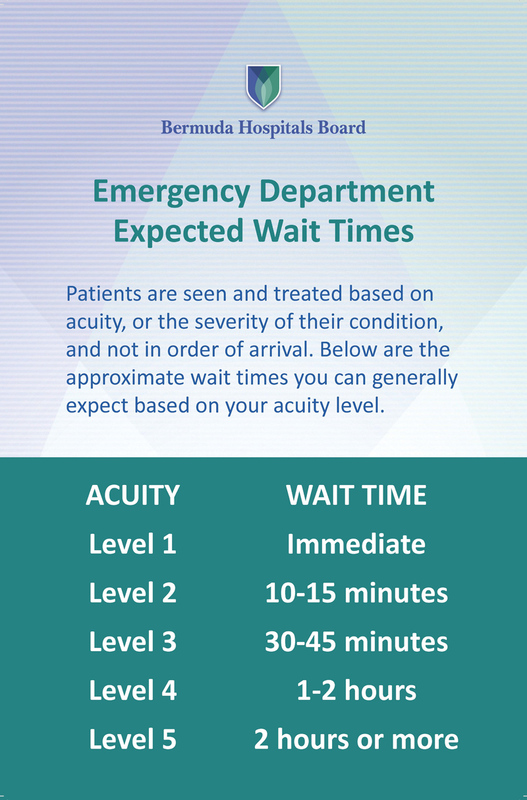 Emergency Department staff will tell you your level and expected wait time when you arrive.